as you might already knew, leland passed away this week. he was always the star of (and inspiration for) friday cat bending and the feature won't be the same without him. i'd hoped he would be around for a couple more years of cat bending, but it wasn't meant to be. i'm glad, though, that i was able to get out 7 installments before he went. i still have a few more decent unused photos of him, so i might still do 1-2 more of these "in memoriam" installments, depending how i feel about it. it's ironic—when he was still alive and i expected him to stick around for a couple more years, i was planning to start branching out and bending pictures of other cats, just to keep the feature fresh. now i don't know. it wouldn't seem right to bend other cats now. and if i ever do start it up again with other cats, it'll probably be even more sporadic than it has been to date. i wanted to do at least one more edition of cat bending in tribute to leland and the 7 years of happiness he brought me. for this tribute, i wanted to do something really special, something different. so i made sure to find a photo i really liked, and experimented with some new file formats: PCX and PNG. 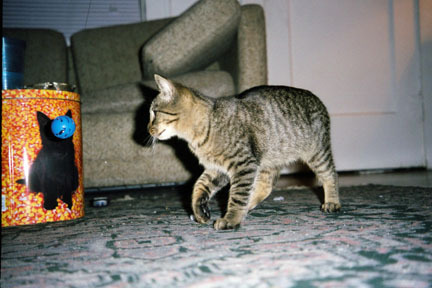 this photo is very old, dating circa halloween 1998, when he was still a small kitten. the photo was actually taken on a film camera, and when i got the film developed i opted for the "photo cd" in addition to standard prints (seems quaint, doesn't it?). i ran an "auto colors" script on it, which really made the colors pop. i like how the cat toy (which is on a string) is coincidentally right in front of the cat's face on the popcorn tin. the image size is a peculiar 1536x1024. PCX: bending PCX files apparently results in this unusual effect. the files look rather like i jumbled up the contents of a BMP or TIF file, but that's not what happened at all. when i bent just a few bytes of data, everything after that point in the file ended up looking like that. very interesting, but after a number of attempts, it became clear that this was the only look i was going to get, so i moved on. PNG: i had tried bending PNG files before and had given up, thinking that it wasn't working because the bent files just wouldn't open in photoshop. this time i tried again, keeping in mind what i've learned about application sensitivity. it turns out that bent PNGs won't open in photoshop, ever, nor do they seem to open in my web browsers (in my tests, IE and firefox would both load the files normally, up until the files were 100% loaded, and then they'd bring up an error or a red X), but they do open in paint and windows picture viewer on my home computer. i couldn't get them to open up in win2k, as that version of paint doesn't support PNG, though you might get them to work if you found the right software to install. Rest in peace leland, I so hate when they leave us.